Small group tour operate with minimum 2 people in the group. Morning departure from Prague Hotel at 8:30 a.m. for the world famous spa town of Karlovy Vary (Carlsbad). During the sightseeing tour you can marvel at the elegant palaces frequented by former royalty and its adorned promenades with the many drinking spring fountains. Dinner and overnight in Karlovy Vary. Breakfast. Drive to Plzen (Pilsen), home of the famous Pilsner Urquell Brewery. A visit to the Pilsner Urquell Brewery with tasting is organised followed by a short sightseeing tour. Continue to the capital of South Bohemia, Ceske Budejovice (Budweis) and admire its unique historical market square. Drive to the UNESCO town of Český Krumlov and admire its numerous medieval buildings. Dinner and overnight in Cesky Krumlov. Breakfast. Sightseeing tour of Česky Krumlov will include a visit to Cesky Krumlov Castle. In the afternoon depart for Treboň, the famous centre of the Bohemian fishing lake area and a well-known spa town. Visit to Třeboň Castle. In the evening a walking tour of the town. Dinner and overnight in Trebon. Breakfast. Continue through the lush countryside of South Bohemia, stopping in the UNESCO listed historical town of Telč a romantic little town with beautiful Gothic, Renaissance, and Baroque houses. Continue to Lednice in South Moravia. Dinner followed by a visit to a local wine cellar to taste the famous local wines. Overnight in Velke Bilovice. Breakfast. 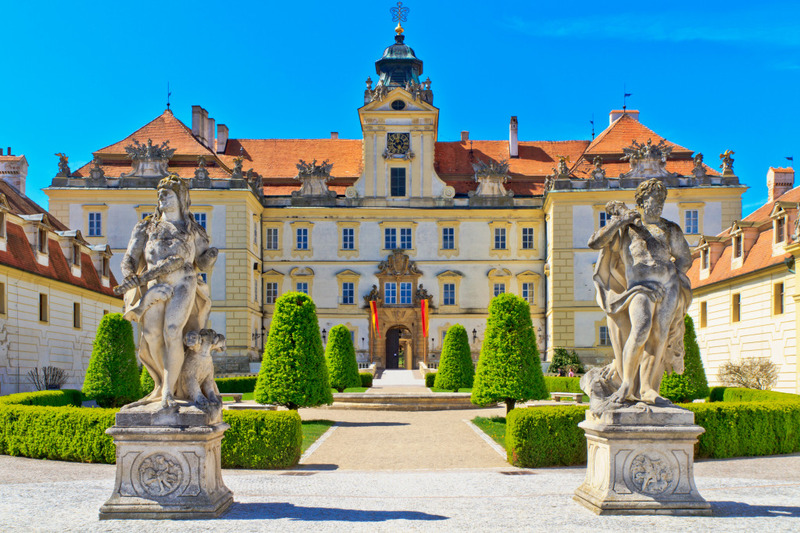 Visit the Valtice and Lednice Castles, UNESCO Heritage sites. These gorgeous residences of European aristocracy are surrounded by French gardens and huge English style parks. Drive to the national nature reserve of the Moravian Karst. A boat ride on its subterranean River Punkva will be combined with a visit to the Macocha Gorge hiding extensive caverns and emerald lakes. Drive on to Brno, the capital of Moravia, the province of rolling green hills and colorful villages. Dinner and overnight in Brno. Breakfast. After a short sightseeing tour of Brno, drive to Central Moravia where two historical cities will be visited – the garden city of Kromeriz and Olomouc, the city of churches, featuring one of the largest collections of historical monuments in the country. After a short sightseeing tour depart back to Bohemia to the city of Hradec Kralove, important center during the Hussite Wars. Dinner and overnight in Hradec Kralove. After breakfast a tour of the medieval mining town of Kutna Hora. A UNESCO founded in the 13th century which is famous for its silver mines. Visit St. Barbara’s Cathedral with its precious wall paintings and the unique Ossuary (tombe). Continue on to Prague where this tour ends.